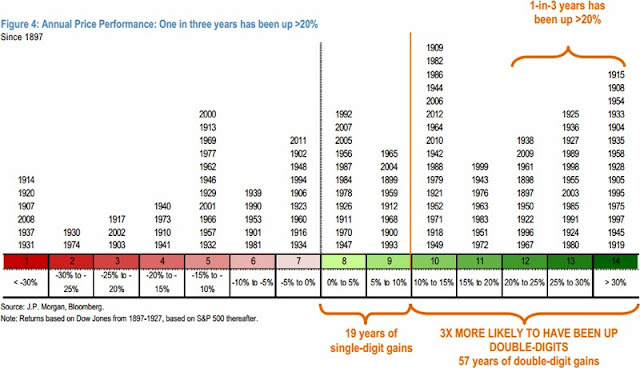 2016 was a continuation of the bull market that is now the second longest on record. If it continues into March of this year it will be the longest bull market ever. Buyer beware. Market returns were strong, with the technology heavy Nasdaq up by the smallest amount. The TSX had a strong year as commodities roared back from two year lows. Agricultural commodities were still weak in 2016. Owning US Dollars (USD) assets was a small detractor for Canadian investors. That said, I am still a USD bull, so no need to hedge the currency yet. In currencies, remember the trend is your friend, and the stronger USD and weaker Canadian Dollar (CAD) trend is still intact. There is almost no argument for a stronger Canadian dollar unless oil prices rise significantly. So how did the stock recommendations for 2016 turn out? Total returns include dividends and I also included what the total returns were in Canadian Dollars. This year, the five stocks picks hit it out of the park with an average gain of 59%, or 57% in CAD. EZPW had a huge year, more than doubling. That result wasn't really surprising given how cheap it was. 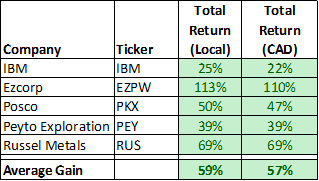 PKX, PEY, and RUS all came back to life with the recovery in the energy markets. IBM is still a solid pick that constantly churns out cash. RUS was so cheap last year it was like shooting fish in a barrel. 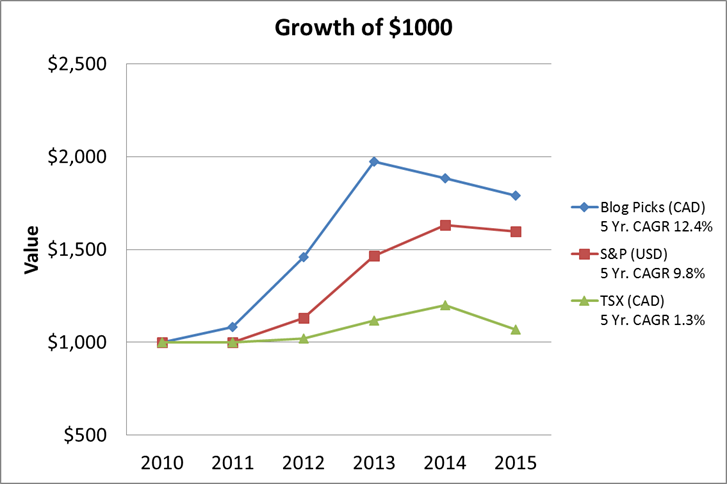 So how has the growth of $1000 been since I have been doing these annual predictions? 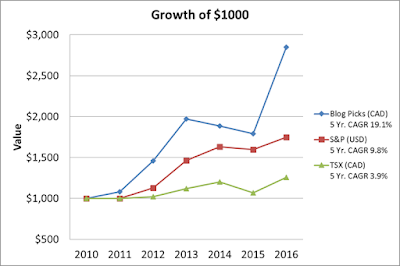 Overall they are up at a 19.1% compounded annual growth rate (CAGR) for the past six years, or close to doubling every 3 years. Relative to the market averages, that return is more than double the S&P 500 in USD, or almost 5 times the Toronto Stock Exchange (TSX) over that period. The results have been lump but I will gladly take a lumpy 20% CAGR over a steady 10% CAGR. Linear investment returns are not for this value investor. As I said last year, I would be back to comment if the markets tank. They didn't tank and rallied hard after the Trump election victory. Everyone is talking about huge economic growth coming from the new policies, which I believe will be beneficial, but will take time to work. I definitely am not a bull this year. I cannot find many companies that are cheap, so that is why I recommend cash. As already mentioned the US markets are now into the second longest bull market of all time. For myself, I have been a net seller during the past year. I have a lot of cash and will only hold long term high quality companies that continue to compound and grow capital at a high rate. If now isn't the time to raise cash, when is? Valuations are too high for this value investor. I will gladly sit in cash and be patient if I have to. I can be stubborn for years. My methods work and I have crushed the markets over the past decade. The most important thing is to understand what you are doing and hold true to those principles. Most people have no idea what they at doing. 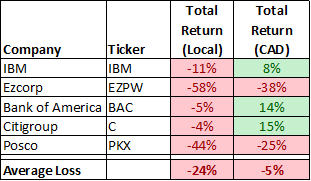 Looking at the list for this year, IBM and Ezcorp are carry overs from last year. Both are still cheap. I added some new ideas that are statically cheap but difficult areas to pick stocks. The first is emerging markets which have been struggling for the past several years due to the fallout of commodity prices. It is a great area to look for value as emerging markets have been left for dead and are selling for cyclically adjusted price to earnings ratios that indicate value. Russian stocks were up big in 2016 and yet only sell for 6 times earnings. Don't look for individual names, but a buy solid low cost index ETF like the one from Vanguard... and hold it for a couple years. Last but not least... Uranium. As a value investor I have to go where the value can be found and Uranium stocks are down 75% over the past 5 years and are down 90% since 2010. Cameco is a very solid Canadian company who owns some of the best uranium assets in the world. They have a very strong management team and a lot of depth in the company. A few classmates in my MBA program were from Cameco. Investors shouldn't be overly worried about the lawsuit with the Canada Revenue Agency (CRA), the company did nothing illegal and could set up the same transfer agreement today. The problem is in hindsight, it looks like it was set up to avoid taxes, and that is why the government is looking for part of the gains. Overall, Cameco is cheap selling for book value. I guarantee you that if you wanted to replicate their assets you couldn't if you tried. And why would you? You can buy them at today at cost in the market... and this after rising 40% in the past two months. Global X Uranium Fund holds a basket of uranium stocks. It is also poised to do very well if uranium rebounds. Cameco also happens to be the top holding in the fund. Buy this basket if you want diversification. 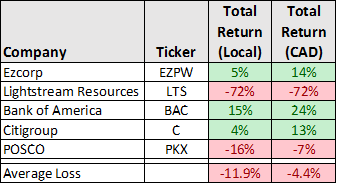 Well 2016 turned out to be a huge year for returns, and I certainly didn't expect it. I definitely do not expect 2017 to be a repeat of 2016 but you never know. Both Canadian and US stock markets are selling at very high valuation levels so buyer beware. 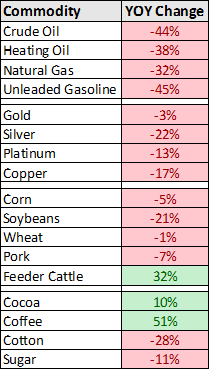 The story of 2015 was the carnage in commodities and the weak Canadian Dollar. This has been a reoccurring theme on this blog. This is what I said last year. "Fellow Canadians could have benefited from the fall in commodities by not owning Canadian Dollars. Canadians who invested in the US not only realized out sized gains this year, they also realized foreign currency gains that contributed an additional 7% to their returns. I figured it was only a matter of time before oil fell and boy did it in fall off a cliff in 2014. Similarly, the falling Canadian dollar was another theme that continued in 2014. As I have said before this is a great way to be short commodities since the Canadian dollar is very closely tied to commodity prices." By owning USD assets, the gain for Canadians was 19% this past year. 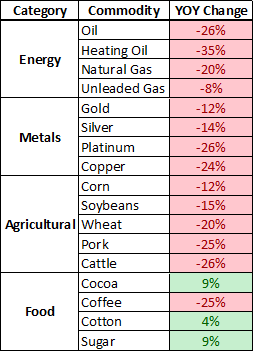 Here is what happened to commodities in 2015. Market returns were mostly flat with the commodity heavy TSX falling the most. As most Canadians are now aware, it was a fantastic year to own USD assets. So how did the stock recommendations for 2015 turn out? Total returns include dividends and I also included what the total returns were in Canadian dollars (CAD). Overall the results were terrible but were helped greatly by the falling Canadian dollar. Despite the very poor returns, I still like many of the names on the list. They are cheap and some got really cheap this year. That is the way it goes some times. Since I have been at this blog for 5 years now, I thought I would include the following graph. Picks on this blog have soundly trounced the Canadian market. 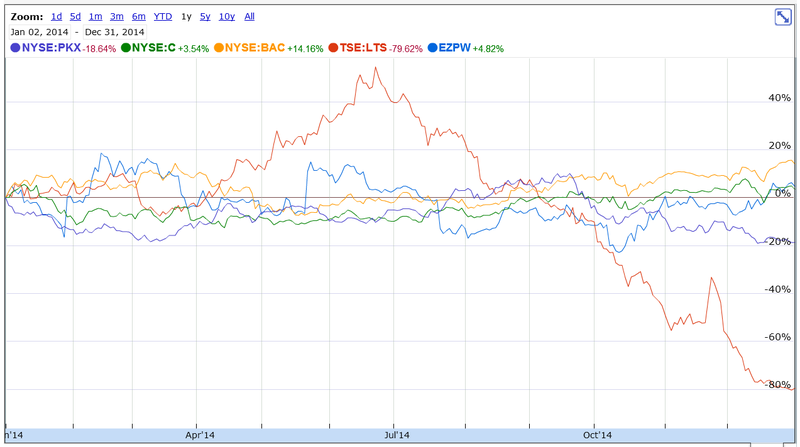 I still like IBM, EZPW, and POSCO. See what I said about them last year for more information. During the past year I have purchased more IBM and EZPW. The two new names on the list are Canadian companies. The benefit from owning USD assets is nearly over, however the Canadian dollar will likely weaken further in the coming year. These two new companies will add some energy exposure while both being very low risk. The are both still profitable. All of the companies on the list have large upside potential. Peyto is a natural gas company. They earned $37 million CAD in Q3 2015, more than every other oil and gas company in Canada except the major integrated oils. Peyto is the lowest cost gas producer in Canada, and with hedges they are still profitable. That said, if now isn't the time to buy natural gas assets, I don't know when is. Nearly every natural gas company is Canada is losing money big time. If gas prices stay low this year, expect numerous bankruptcies. Natural gas prices have only one direction to go, and that is up. Russel Metals is one of the largest steel service centers in Canada. Russel earns half of it's revenue from the oil patch, so it is somewhat tied to the energy market. Energy activity has been extremely slow so half of their business is struggling. I still don't expect a strong recovery from the energy market but overall the company will be fine. The second headwind the company has faced this year is falling steel prices. As a result, they had to take some write downs of inventory this year. Steel prices in recent weeks appear to have bottomed. If steel prices rebound, this headwind will turn into a tailwind and their inventory will appreciate in value. Service centers, like any other wholesaler, isn't a difficult business to run. They buy steel for a dollar, mark it up 20% and sell it. The key is to maximize sales and inventory turns. If the markets tank this year, I might be back to comment. The markets are more than fairly valued as the Russell 2000 and the S&P 500 are selling for 153 times and 23 times earnings on a trailing basis. That isn't cheap. The market breadth for both the S&P and the Russell has not been strong recently. This is usually an early warning sign. Shorting the Russell 2000 may prove to be a good trade for 2016. Disclosure – I own IBM, EZPW, PEY and RUS. This is a follow up on my last post Top Investments for 2015. I was asked the following question in the comment section. This answer is a little more than a comment so I decided to post it here. Thanks for your question. The price to tangible book value for C and BAC as can be calculated to be 0.9 and 1.2, respectively. Whether or not that is cheap enough for you, is something you will need to decide. Let me offer some additional thoughts on BAC and then on C. BAC has paid out around $100 billion in legal expenses over the past 5 years. Their tangible book value has risen slightly over that same time. Given the fact the company has close to $150 billion in tangible book value, legal expenses of this magnitude are not insignificant. The next fact I would point out is that in Q3 2014, the company earned $5.0 billion in profits excluding the consumer real estate services (CRES) division. 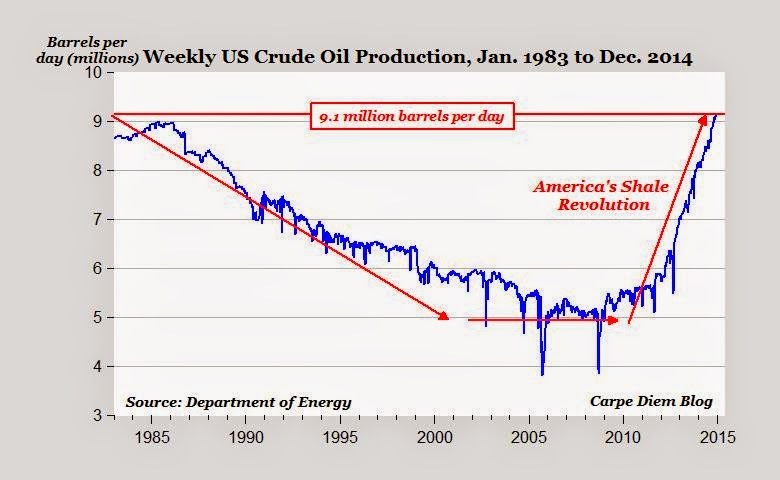 Annualized this works out to just about $20 billion per year or $1.88/share. Let me be clear, Bank of America earns this amount of profits already today. 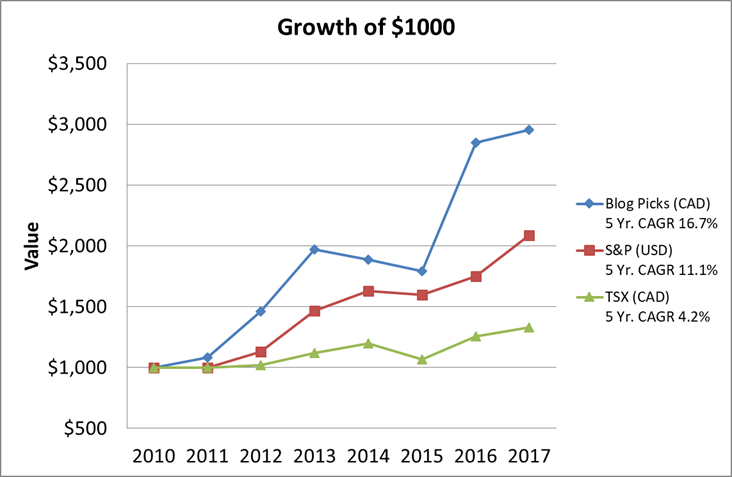 They are earning this amount in a sub-optimal economy, a low interest rate environment, and with many regulatory headwinds. All you have to do is wait for the dust to settle and the earnings power of the company will come shining through. Now this $20 billion in profits works out to be approximately a 0.9% return on assets (ROA). On a comparable basis Wells Fargo (WFC) is earning 1.3% on their assets. I believe that with strong management BAC can earn above 1% on their assets, just like WFC does. The reason for this is that BAC, just like WFC, has a large, low cost deposit base supporting their assets. Including non-interest bearing liabilities, both companies have access to over a trillion dollars in deposits at a cost of 0.1% (10 basis points). Coming back to the returns on tangible common equity, we have already established that BAC has a number of businesses that together are earning 13.4% on tangible common equity (TCE). This is interesting because WFC is earnings 13.8% on TCE, and JPM is earning 13.5% on TCE and C is earning 6.5% on TCE. If BAC was valued on the same P/TBV multiple as WFC or JPM, the stock would sell for between $19-25/share. So nothing has to happen and the value of BAC's stock will rise somewhere between 15-50% as the underlying earnings emerge. Any help from a rise in interest rates and it will have real liftoff potential. Oh and perhaps the CRES division will turn a profit and the company will be able to utilize their deferred tax assets (>$30 billion). If the company earns $80 billion over the next 4 year, it isn't hard to make the case that the common shares will sell for between $35-40/share. Of course a large portion of these returns will likely be dividends and share repurchases but the net result is the same, the common shareholders will realize over 20% annually over that time period. Turning to Citigroup (C), they are selling at a much lower price to TBV. As noted above that is warranted because of they are earning only 6.5% on TCE. Their ROA is only 0.6%, lower than BAC (ex CRES) and JPM at 0.9% and WFC at 1.3%. Don't let this fool you, they have higher earnings potential just like BAC. As the real earnings power of the company emerges, they will earn around 1% on assets. If you apply a 1% ROA to C, the net result is an EPS of $6.21/share. First Call analyst estimates are for $5.41/share in 2015 and $6.52 in 2016, so we are right in the ballpark. Citi also has over $50 billion in deferred tax assets. In today's markets there are few companies that can be purchased at less than 10x normal earnings and C is one of them. In the future the shares will sell more in line with BAC and JPM at 1.3 P/TBV, or around $75/share. So the upside is easily 50% and all shareholders have to do is be patient and watch the earnings rise. Disclosure: I own BAC common, BAC Class A Warrants, JPM & WFC. Below is an update to the ACQ article I wrote a few months ago. It was selected for an award at seekingalpha.com. Please note the article will be open to the public for the next 48 hours. The article also explains why I haven't written much in the past few months. I am currently pursuing my MBA. One of the perks of having a blog like this is that you get contacted by a wide variety of people. Most people want to discuss investment ideas, some discuss startups, and some are company executives or directors. A few months back, I was contacted to do a book review on a home grown Canadian value investor. Since I love to read I could never turn down a book, particularly one related to value investing. The book is called The Value Proposition – Sionna’s Common Sense Path to Investment Success written by Kim Shannon (CFA, MBA). Kim has over 25 years of investment experience as a value investor and since 2002 has served as chief investment officer and president of the firm she founded, Sionna Investment Managers Inc. Overall ,I would recommend the book to those who want to understand the fundamentals of the value investing framework. The book caters to a wide audience and I feel both investors and non-investors will learn something from the book. One thing I found particularly interesting was the reasons why they talk to the management of the firms they invest in, while most value investors don’t (more below). The book is divided into three sections. The first section is an introduction to Kim Shannon and the firm she founded. The second is about Sionna’s philosophy and the last section is about the how Sionna implements its own take on value investing. In this article I will describe my key takeaways from the book and a few principles that I found interesting or disagreed with. This section discusses Kim’s unconventional upbringing in a military family. Which had its positives but also had it's negatives. The most positive lasting impacts were that she developed independent thinking abilities and wasn’t afraid to stand alone (pg. 11). These attributes will help any value investor as you must be able to trust your own judgment. Kim also had a passion for reading and learning. Those are both cornerstones for personal development and are critical for investment success. Sionna is based on a value philosophy and they strive to be client centered. Although most investment firms say they are client centered, I definitely took away from the book that they have more integrity than most investment firms in this regard. One of the most important keys to a successful investment management firm is to have clients who both understand and share the investing mindset of the firm. For value firms, this means underperformance when bull markets are raging and outperformance often comes when markets turn down. The reason this happens is that value investors have a belief in the rationality of the markets over the long term, but definitely not in the short term. I couldn’t have agreed more when I read this quote. People don’t get quotes on land, houses, or other assets they own every hour, but they do get quotes on price of businesses on the stock market every second. These values can and do rise and fall quite dramatically over short periods of time. This is what makes value investing successful because if you can successfully value a company and buy at a discount you have much better odds at outperforming those who don’t have a clue as to what they are doing. And that includes more investment professionals than you realize. One key difference from Sionna to other investment firms is that they use a relative value approach. This means they select stocks from all sectors and also stay invested in bull or bear markets. They are always looking for the cheapest companies in each sector at all times. This is particularly important in Canada where resource and financial firms dominate your investment choices. The benefits of the relative value approach listed in the book were better diversification and a smoother ride. The smoother ride is definitely helpful to keep clients from selling out at the wrong times. While the relative value approach has some benefits I couldn’t help but ask myself, what are the downsides? This is where I found the book lacked because it didn’t discuss the downside. I feel there are a few downsides to this approach. First of all, a relative value approach may take you into a sector where all companies are overvalued. Just because a stock is the cheapest in a sector doesn’t mean it is cheap. It could also be overvalued, so why risk the capital for the sake of diversification? Secondly, the smoother ride is nice but you can't do this without sacrificing the highest attainable total return. Personally, I prefer to go where the value is and not be constrained by any sector or requirement to be diversified. Some of the other foundations to their approach are reversion to the mean and the sources of total equity returns. What I found interesting is that in range bound markets (see GDP & Stock Market Returns ) 90% of equity returns comes from dividends. This makes total sense when you look at a company like Microsoft that has been range bound for more than a decade. While the company has experienced very strong earnings growth, it has been masked by shrinking multiples (P/E ratio). In Microsoft’s case the P/E ratio fell from over 40x to under 10x during the last 14 years. The only return investors in MSFT’s stock have seen (until very recently) was in the form of dividends. The book briefly talks about other philosophies such as growth, momentum, speculators and Growth at a Reasonable Price (GARP). I find GARP to be self-deception at its finest. I constantly see lots of wannabe value investors turn to “GARP” to justify the purchase of their stocks. Once you start to talk about “growth” you are now turning from what you know to trying to predict what you don’t know. Being able to differentiate between what you know and what you don’t know is critical to investing. On a whole I must say I was greatly drawn to the firm and the principles on which they stand. I wouldn’t hesitate to send potential clients there way as they appear to have more integrity than most investment managers. This is where the book does a really good job and opened my eyes to help me improve my investing ability. First of all, the book describes their Intrinsic Value Model (IVM). You will have to read the book for the details; I can’t give it all to you here. What I will say is that it involves three major quantitative factors: book value, historical ROE, and relative P/E ratio. Those are all foundational to my own philosophy, so I almost felt I was reading my own approach to investing. I tend to think in terms of slightly different factors, those being: book value, normalized ROE, and relative P/BV. These are only slightly different ways of thinking about the same quantitative factors they use at Sionna. From the three quantitative factors they calculate a rough intrinsic value and expected return. After it passes this preliminary test they do more fundamental research into the company’s financial position. I especially liked how they approach financial statements very skeptically. Another key difference to Sionna’s approach is that they attempt to meet with the management of the firms they invest in. The reason why they do this isn’t to find out more information, although they usually do, but it is to determine whether management is honest and trustworthy. Most value investors don’t bother meeting with management because they don’t find it worthwhile and it may even lead to a bad decision. The reason is that most CEO's are typically quite charismatic and are able to sell ice to an Eskimo. If you are looking for a decent book to explain the value investing approach, I would recommend this book. It provides enough information on both the quantitative and qualitative approaches to solid investing and doesn't waste pages with useless drivel. As I like to say, most books could be written as a pamphlet and very few authors actually provide new material, chapter after chapter. While I understand why they use a relative value approach, I personally could never take such an approach. I just can’t invest in something only because it is relatively cheap. If you are interested in learning how to determine the intrinsic value of a business, the model discussed in this book gives a solid framework on which to do that. From there you have to dig deeper and look at other quantitative and qualitative measures that are discussed in the book. P.S. I am currently reading Stress Test by Tim Geithner, and it is a fantastic book about the financial crisis. I'm about half way through and so far I am fascinated at how the various government officials felt like they had to act during the crisis. The CEO is selling between $115 and $150 million of AutoCanada stock. The company is selling $200 million in equity, doubling its equity capital. These actions confirm the overvaluation of AutoCanada. In my recent article AutoCanada: An Easy Short, I demonstrated the overvaluation of AutoCanada (OTC:AOCIF) (TSE:ACQ). This thesis was recently validated when AutoCanada announced it was raising $200 million in equity. Beyond this, Canada One Auto Group (CAG) is selling $150-200 million of ACQ shares in a secondary offering. Both of these offerings are quite intriguing for different reasons, and will be investigated separately. I sold the company, the CEO is selling the company, and senior management is selling the company. That leaves the question, who would buy the company at the current price? AutoCanada's market cap has exploded from $350 million to $2 billion in a year and a half. AutoCanada's valuation is 3-4x higher than its US peers on a P/E, P/S, P/B, and P/CF basis. The strong auto sales market over the past 4 years has been a huge tailwind. It will no longer have this tailwind going forward. AutoCanada doesn't have voting control over some of its dealerships. 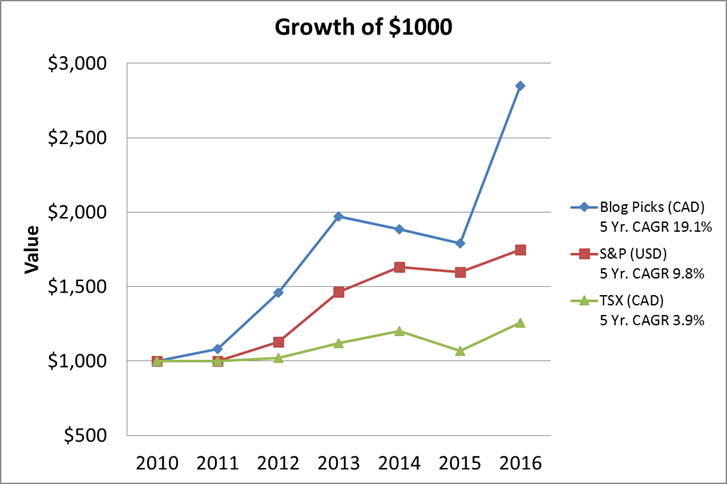 Analysts present the illusion of a huge number of acquisitions targets and unlimited growth in Canada. They truth is it only has 3x upside in Canada. I don't typically share my stock purchases, but this is a unique situation in that I am shorting a stock and I am seeking to bring about a more rational price in the shortest time frame possible. The stock is AutoCanada (OTC:AOCIF, TSE: ACQ), listed on the Toronto stock exchange. Simply put, the company owns and operates around 34 car dealerships in Canada. The reasons why I am short the stock are explained in the graph below. Every Monday morning I listen to EconTalk, a weekly podcast where Russ Roberts interviews various people of different backgrounds to discuss relevant economics issues. Russ is a research fellow at Stanford University's Hoover Institute. He is a fantastic interviewer, makes you think, and often discusses the "unintended" economic consequences of various economic ideas or policies. This past week Russ interviewed technology venture capitalist Marc Andreessen. Mark is best known for co-creating the early web browser Mosaic, and later co-founded Netscape. The interview this past week between Russ and Marc was absolutely fantastic. It is not very common for me to discuss these podcasts with friends/fellow investors but I couldn't resist after listening to this one. They discussed the challenges of being a venture capitalist (predicting future trends in tech), how smartphones are causing a technology revolution around the world, how Bitcoin is so much more than a digital currency, and how technology has and will affect areas such as newspapers, healthcare, and education. The entire interview is great but I found the second half of the podcast to be outstanding. As many investors understand, the newspaper industry has come under heavy pressure from the internet starting around 2007. Newspapers, once fantastic businesses are now losing money and have lost their monopolistic dominance over local markets. The internet now allows people to access news much faster and from different cities. Marc discusses how the internet has fragmented newspapers and how competition is forcing them to change. The local monopoly's they once enjoyed are over. He also discusses the one gift that the internet has given to the newspaper industry. Myself, like Russ and Marc believe there is still a market for good journalism and news but the future will look different than the past. Also, the discussions about Bitcoin, healthcare and education are all well worth the free price of this podcast.